New computer. People dying. Family stuff. Work. Social stuff. Life is hectic. We are two people without children and not many friends. Why is this so? I am writing this on my tablet as Little Jo is in my computer chair. Her mothers are staying in a nearby hotel celebrating their anniversary. The hotel was cheap and as they discovered, for a good reason. They have been to the tennis today. As a model employee, work offered me free tickets to the tennis. My reply was a sugary sweet 'thank you so much for thinking of me but I would have to take a sickie (sick leave) to attend'. Little Jo and R made pizza and salad for dinner tonight. Little Jo proclaimed she did not like our variety of lettuce leaves in the salad. She said someone called either Horrible Henry or Honourable Henry was paid £2 to eat something when he was holidaying in France. I said, Little Jo, if I pay you $2, will you eat the lettuce? No, was the reply. £2 is $6. Nice try Little Jo. I think about $4 and I am not paying you. The way our dollar is going though, it may well be $6 soon. Cast your mind back to when you were eight. Did you have some knowledge of currency exchange rates? I sure as hell did not. Are we bringing up over knowledgeable monsters? Back in Old Blighty in the olden days, Sir Nigel Gresley designed a high speed steam train. On a slight downhill slope and no doubt with its tongue of concentration firmly between its lips, the train broke the steam train speed record when it reached 200 km/h, 125mph. Oh that Australia's modern electric and diesel trains could reach such speeds. 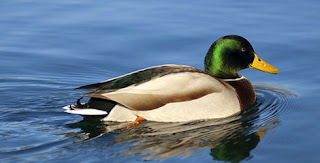 As was his habit of naming other train engines he designed after birds, he named it the Mallard, after the Mallard duck. Gresley died in 1941 and in the great engineer's memory, the Gresley Society was formed. As the 75th anniversary of his death approaches, the society, flush with funds from a bequest, commissioned a statue of Gresley to be installed at London's Kings Cross Station. Terrific, hey. The sculpture was commissioned at a cost of over £100,000. Better be good and better be bronze. It is in my opinion and it is bronze (unverified). A maquette was made and in this photo from The Guardian, you can see what the statue will look like. Isn't the addition of a duck to represent his Mallard train such a cute touch? Everybody thought it was, including the local council, the railways authority, public opinion and the Gresley Society itself. What could go wrong? Everyone was happy. Well, not quite. Gresley's grandchildren (some?) did not like the addition of the duck and they made their views known to the society. 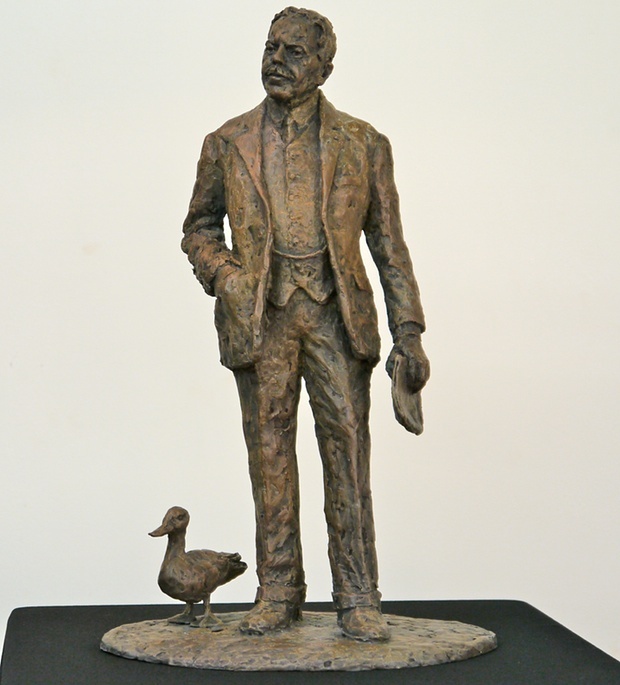 The debate has subsequently torn the society's committee apart and so far as I can tell, a decision has been made to omit the duck from the sculpture. Poor Gresley, a man left without a duck. As I said, this is an important world matter and you can sign a petition here or like the Facebook page Save Gresley's Duck. PS A new computer has arrived and I expect I will be busy for a few days. It is about seven years since we saw our dear friend Dame M off at the ripe age of 82. For a heavy smoker and drinker, that wasn't a bad age. Little did we know that we would be seeing her boarder, sometimes known as Jasmine, off at the not so ripe age of 63. The Boarder rented one of Dame M's flats, which was adjoined to her own home. For around thirty years they kept both company and worked together in the fashion and manufacture of specialist fashion. You could read that as dressing the rich and famous, theatre costumes and drag queens. A call came from our ex NT Politician friend on Friday night who asked if we had received a text from the person I call our Hairdresser Friend. She was closer to The Boarder than us and had received a call from one of his sisters to say he had died. We, and everyone The Boarder knew were in shock. For some months he had suffered from extreme itchiness of his skin and the doctors could not diagnose the problem. Eventually it was discovered he had a lymphoma cancer. A large growth was cut from his neck and was healing well. He had undergone chemotherapy and was 3/4 through his radiotherapy. A week ago he was staying with his sister in a Victorian regional city, with the sister giving him good support and feeding him up, and then he became quite unwell and she took him to the local hospital who quickly transferred him to his city hospital where he had received specialist treatment. Peter Mac, if you are a local person. He quickly began to fade and it seemed no matter what doctors did, they could not stop the process and eventually his sisters made the decision to let him go and life support was turned off and the physical response was almost immediate. And then the phones, the text messaging, the emails and the FB posts started. I am as guilty as everyone. Saturday night we caught up with a few friends at the local pub for a meal and The Boarder's death was most in our conversation. I could write forever about what has gone down, but no matter. The hospital where he died has requested a post mortem from the family and they have agreed. The hospital seems at a loss as to why he died, to be technical, why his lungs flooded with fluid. Btw, so far as I know, none of The Boarder's first class treatment has cost him anything. We pay for it in our taxes and that is how it should be, although he did complain about after therapy he had to catch public transport home when he was very shaky, and then a volunteer driver stepped up to provide car transport. This is strange because normally a hospital won't let you out of their sights after treatment without someone to accompany you, even after a minor procedure. While we weren't really close friends, we would see him a few times a year when we all got together to celebrate birthdays. The last time we saw him was in November when we celebrated his own birthday and Jasmine's last drag performance was for the Brighton Antique Dealer's 80th birthday last August. As yet we don't know the funeral details. His death has hit R harder than me. I was ok until we met up with the Hair Dresser Friend and the presence of an mature woman, well 50ish, started my proper grieving process after a big and comforting mutual hug. Sunday after a late Saturday night where drinks were involved and I didn't wake until 8 and R until 10, what to do? Gay and Lesbian Midsumma carnival in the nice gardens on a pretty warm day? Nah. We are too old. Instead we drove to the Altona car wash where we washed the car and then headed for Altona Beach Village. Mid winter you could almost convince yourself that Altona Beach and the village is Melbourne's hidden secret. Not today when it was quite warm. Ten minutes of driving around looking for a vacant parking space had me saying, we should have caught the train but given the purpose of being that side of town was to wash the car, that is silly. R and myself had a wonderful lunch at Creme. The food and coffee is terrific. It was busy and we waited for quite some time for our meal, but the atmosphere was so pleasant and the staff so nice, who cared. R perused the Sunday Herald Sun newspaper and I found I had a Telstra Air signal, so I looked at newspapers around the world. I am thinking about whether I should include a photo of the late Jazzie, or his real life persona. Not sure. Maybe later. Join in with River and others for Sunday Selections. Aside from the first photo of a very nice building perhaps in Collins Street, the other shots were all taken in A'Beckett Street in the city. It was never a street of high style and so was pretty well left alone while many other city streets were 'modernised'. The photos kind of speak for themselves, nice human scale buildings without being too flash. A small part of what is the Victorian Historical Society building, once the Australian Army Medical Corps Drill Hall. This seems to be apartments now but began life as a box factory. It went on to become the Salvation Army Gill Memorial Home for Men, in other words charity accommodation for homeless men. An unlikely looking building for childcare, but beside the building is a courtyard with the ubiquitous sails to protect the children from the sun while they play outdoors. A quite sympathetic upper extension. I believe the Spiritualists Union has sold this building. Developers are all over the street but an owner occupier has paid $3.24 million for the building. It seems, unusually for Melbourne, to be made of sandstone. Once a printing works and previously owned by the Catholic Church and has now it seems been bought by a Singapore developer for????. Yep, a highrise tower. Just what Melbourne needs. I hope this building can stay, even if a tower is built behind it. Construction workers taking a lunch break at the Oxford Scholar Hotel at the Swanston Street end of A'Beckett Street. I too am thirsty but I would have to unpleasantly squash in besides two hot and sweaty tradesmen.